If you didn't know, the McMuffin turns 40 years old! Happy Birthday! You still look the same as you did 40 years ago. And as if things couldn't get any better for us McDonald's fans who learned how to make the classic McDonald's Big Mac sauce, there's a video out on how to make your very own McDonald's Egg McMuffin too. The McDonald's Egg McMuffin is what started it all for breakfast sandwiches of all kinds - now Burger King has a breakfast sandwich, Jack in the Box has a breakfast sandwich, Carl's Jr. has a breakfast sandwich, Wendy's has a breakfast sandwich, and many more! 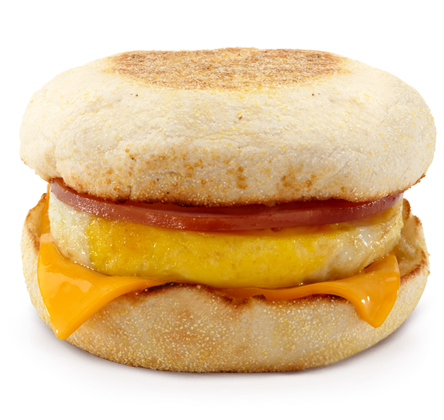 And the original egg mcmuffin is the sandwich that gave us my personal favorite: the Sausage Egg McMuffin. Breakfast since then has never been the same for me, so check it out! The video even shows you how to cook the egg into a circular shape just like what you would get from an Egg McMuffin from McDonald's. And if you didn't have any English muffins, you can use a bagel as the bun for your sandwich instead. Don't feel bad though if you still feel the need to go to your local McDonald's to pick up an Egg McMuffin and coffee in the morning though if cooking your own McMuffin is too troublesome. The Egg McMuffin turns 40!